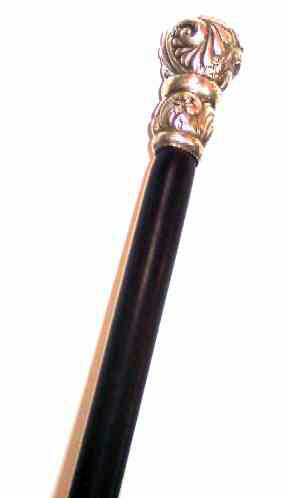 Presented here, an ornately worked silver dagger cane. The top is 3-1/4" high and 1-1/2" in diameter at the top. It is marked Sterling and Solid Silver. With a straight pull a 12-1/2 dagger can be withdrawn from the shaft. The juncture is tight and invisible and the steel blade is a finely worked "whitesmith's" weapon quality blade with "diamond" points. 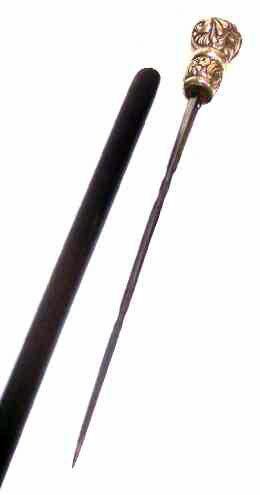 The cane is 33-1/2" long overall and the white metal ferrule is marked H. Schumann, N.Y. Maker.